Quick Summary: Well, motivation is not just about money. And it’s not about enjoying the work you do either. 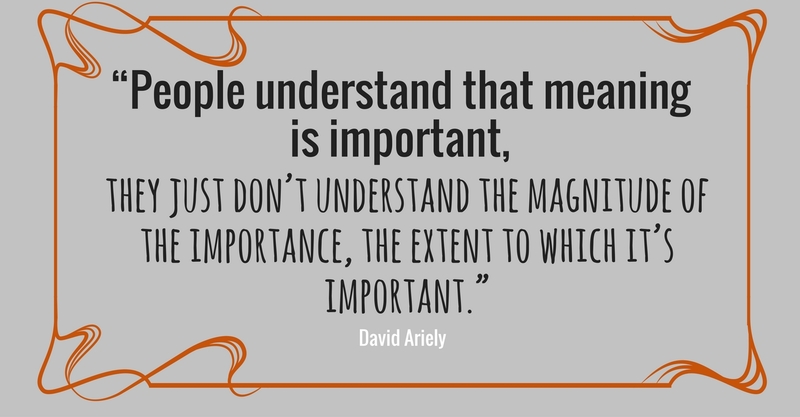 Dan Ariely walks through experiment results that show how important it is that people feel a sense of purpose in what they do. If people don’t feel a sense of appreciation for what they do, their motivation levels drop. This drop in motivation is the same even if they really loved doing the work that they failed to get appreciation for. People need to feel like they are making progress. That feeling of making progress contributes to the level of motivation to continue. The experiment that Ariely conducts was based on building lego models. One group built one model after another using new bricks each time. The second group had to do the same but watch each model being dismantled and reuse the same bricks. The results are pretty conclusive. My Personal Takeaway: If people get motivation from money or just enjoying what they do, why does anyone climb mountains? As Ariely rightly says, read any book about mountain climbing and it will be about cold, misery and pain. Yet mountain climbers generally do it again and again. Motivation can be found even when the obvious contributors – money and enjoyment – are nowhere to be found. Who would I recommend this video to: The manager who is looking at his well paid team that are doing interesting work and wondering why they are not motivated.